Astana’s monument to consumerism, Khan Shatyr, stands at the opposite end of the pedestrian mall from the Ak Orda (White House) and Palace of Peace and Accord. Like the Palace, it was designed by the British architect Sir Norman Foster. 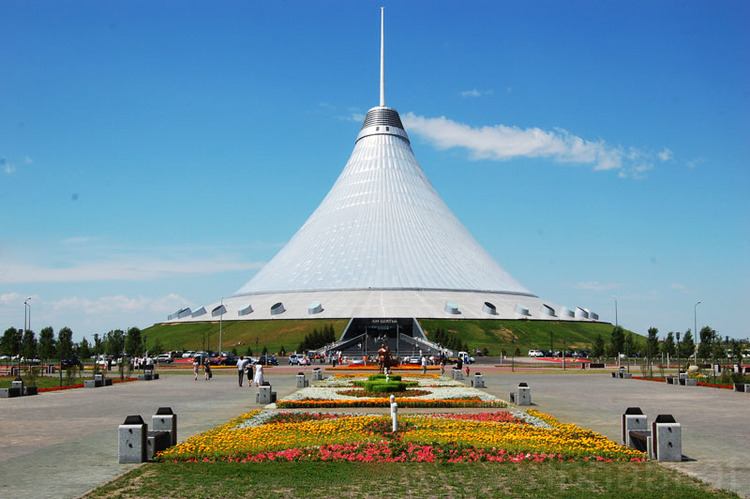 Khan Shatyr has been described as “the largest tent in the world” but to compare it to something you can buy from an upscale outfitter or even to a large marquee is a gross understatement. The needle-tipped structure, 500 feet tall and with a floor area the size of ten football stadiums, is designed to evoke the traditional nomadic dwelling, the yurt. It leans sideways, as if blown by the wind from the steppe. Khan Shatyr is constructed from three translucent layers of a fabric called ethylene tetrafluoroethylene suspended on a network of cables strung from a central spire. The transparent material allows sunlight through, which, in conjunction with air heating and cooling systems, is designed to maintain an internal temperature of 15–30 Celsius (59–86 Fahrenheit) in the main space and 19–24 Celsius (66–75 Fahrenheit) in the retail units. Khan Shatyr roughly translates as the tent of the khan, or king, but it’s all about business and entertainment, not politics. Underneath the tent is a huge shopping mall with squares and cobbled streets, movie theaters, a botanical garden, boating river, mini-golf, roller coaster, water park, and indoor beach resort, with sand, palm trees, and tropical plants shipped in from the Maldives. If Dubai can have its indoor ski slope, then Astana deserves its tropical beach.